Wine, Cheese and Scrapbooking: Witch is not a bad thing? I'm off today (need to use all vacation days left) and I've been doing quite a lot of things, but took a minute to put this card together. This beautiful witch was colored with watercolor pencils. I wanted to provide a faded appearance to the image, and I made it possible adding a little more water than usual. Chipboard sticker is from Recollections, and I used some sequins as additional embellishments. Have a great Friday my friends. Don't forget to leave a comment for a chance to win some candy from Unity Stamp Co.
Fabulous card! love that witch. Like how you did the background with the pink! She has been such a busy witch, this week! The sequins and arrows work well. Great colors and I like the arrows. 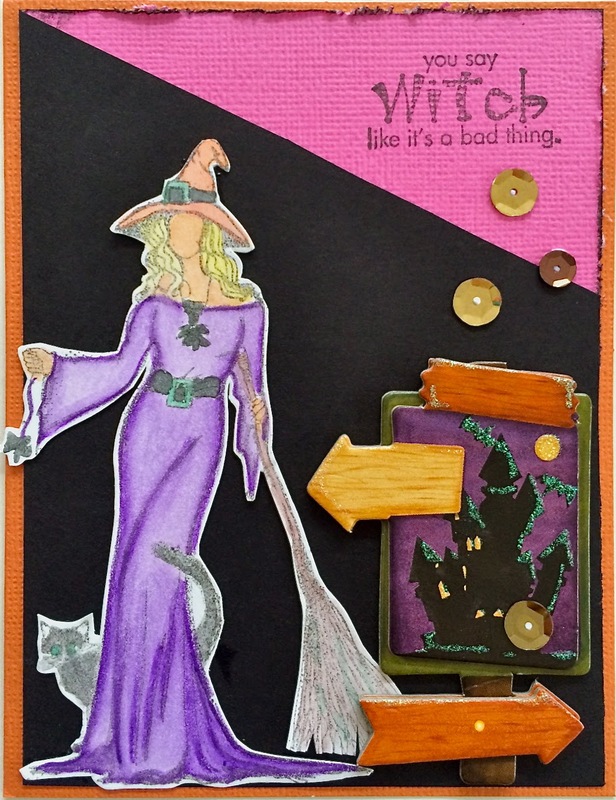 What a great "bewitching" card! I love the haunted house and arrows in the background, and the witch is colored perfectly! Very fun Halloween card! I really like that witch.